Our recent post from Dr. Carole Brown on how to make a multiplying discipleship process work at your parish was one of our most successful posts to date! It seems that people are interested in hearing stories about initiatives in the Church that have been effective at forming disciples. We love sharing these ideas with you for two reasons. 1. 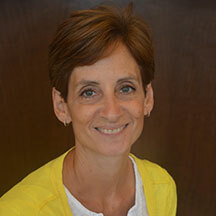 We want to highlight some of the hopeful, positive momentum being made in evangelization. We hear so much about the dire statistics. We want to show you some of the positives. 2. We want to show you what is working and ask these leaders to reflect critically on why it is so that you can implement their core principles in your own parish/school/ministry setting. Why It Works is a new series in which we reach out to some of the most fruitful evangelists we know who are seeing great fruit in their ministries and ask them one simple question, "Why does it work?" Below is our interview with Debbie. Enjoy! 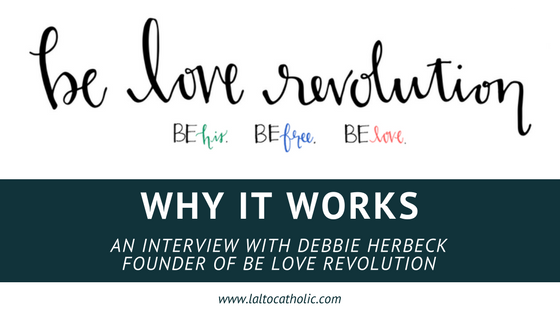 L'Alto Catholic Institute: Debbie, I am incredibly impressed with what I am hearing and seeing from Be Love Revolution. I think a lot of our readers are going to be interested in hearing about some of the genesis for this ministry. It was then that I heard the call to extend this culture of God’s love beyond the confines of camp or a singular event; to begin a movement for young women in junior high, high school and beyond. That fall, we rallied our high school girls, college and young adult women—who had all experienced the Pine Hills Camp “culture”—and launched the Revolution through weekly events and social media. L'Alto: That's amazing. What is some of your vision behind Be Love? Be His—to help young women know the personal and transformative love of Jesus. Be Free—to radically change young women’s self-perception and to help them live freely and confidently. Be Love—to teach and empower young women to be God’s love in the world today. From those first meetings almost five years ago, we have grown tremendously, not only in our attendance, but in the scope of our mission. L'Alto: I love that. You are really walking them through that full growth from pre-discipleship all the way through beginning to bear fruit in the lives of others themselves. Tell me; what kind of fruit have you seen from BLR? In a sense, the fruit of BLR is generated from a culture of faith, love, and acceptance that began and was cultivated at Pine Hills Camp for more than 30 years. The visible fruit can be seen in the lives of the young women themselves, who have progressed from middle school campers, to high schoolers, to young adult women who at each step in their spiritual journey have been evangelized, nurtured, supported, discipled, and mentored in their faith. They now take their place as leaders of other girls and women. As confident, converted young women, they are using their gifts and talents in BLR and beyond through leading, speaking, writing, art, music, drama, etc. As they move from high school to college, many take the Revolution with them, serving with zeal and love in campus ministry, parish youth groups, and the workplace. Many have experienced deep personal inner healing as they discover their true identity as daughters of God and learn how to actively fight the lies of the world. An all-girl environment provides them with the opportunity to learn how to be for one another, rather than adversaries and enemies, and they develop life-long bonds of friendship, support, and sisterhood. There are girls who come to our various events with little or no faith life, and over time they develop a living and active faith in Christ. We have witnessed families—parents and siblings—growing deeper in the faith because of the witness and love of their daughters and sisters. Empowered to be God’s love in the world, hearts for the poor and a desire to serve others grows. Practically, I could name so many different activities that we provide: retreats, worship nights, mission trips, service opportunities, small groups, and mentorship. But the heart of this ministry reflects the mission of St. Mother Teresa, which is to live this revolutionary love by loving the person in front of us—with the love of Christ. This ripple effect is what changes hearts and lives, and ultimately changes the world, one person at a time. L'Alto: That is all so good to hear. Gives me a ton of hope. To kind of sum things up for us, can you maybe just give us a list of a handful of ingredients that you think have really led to BLR being as fruitful as it is? Jesus and life in His Spirit are at the center of everything we do. We help girls come into a living, personal relationship with Jesus. BLR has a defined culture in which girls feel loved, accepted, and safe. Everyone is cared for. BLR is run by young women, for young women. Persistence and perseverance. One-on-one discipleship is an important element; a trusted mentor walks alongside each girl to help them navigate the challenges of their age and the secular culture. Our teaching and testimonies are challenging, yet practical and relatable. We call them to an exciting adventure to live for something greater than themselves and to fulfill their destiny as daughters of God. We desire to support and help parents as they raise their daughters in a culture that is objectively challenging and often hostile to Christianity. The reality is that success is often difficult to measure in youth ministry. Our gauge is obedience to God’s call and growing in love. Thank you so much to Debbie for taking the time to answer our questions about Be Love Revolution! It is amazing to see the great work the Holy Spirit is up to in the Church.